Special order any frame in any of our 700 fabrics, and we'll get it to you faster than those other suppliers. We're always working to reduce lead times and bring the product to the consumer faster. 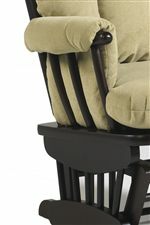 Prop your feet up while snuggling with your little one on this versatile glide ottoman. A plush seat cushion provides superior comfort and support, while a smooth glide mechanism lets you rock your baby to sleep. 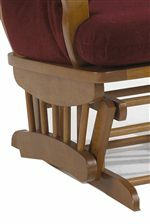 Choose between the traditional glide, or the nursing ottoman to elevate your feet to a comfortable nursing position, as well as maintain a sturdy and stationary position. The Storytime Glider Rockers and Ottomans Glide Ottoman with Spindle Wood Base by Best Chairs Storytime Series at Best Home Furnishings in the St. Louis, Chesterfield, St. Charles, MO & Waterloo, Belleville, Edwardsville, IL area. Product availability may vary. Contact us for the most current availability on this product. Wood & Finish Detailed application of a variety of superior finishes. The Storytime Glider Rockers and Ottomans collection is a great option if you are looking for Transitional furniture in the St. Louis, Chesterfield, St. Charles, MO & Waterloo, Belleville, Edwardsville, IL area. 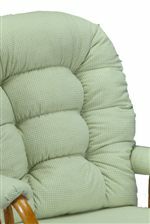 Browse other items in the Storytime Glider Rockers and Ottomans collection from Best Home Furnishings in the St. Louis, Chesterfield, St. Charles, MO & Waterloo, Belleville, Edwardsville, IL area.